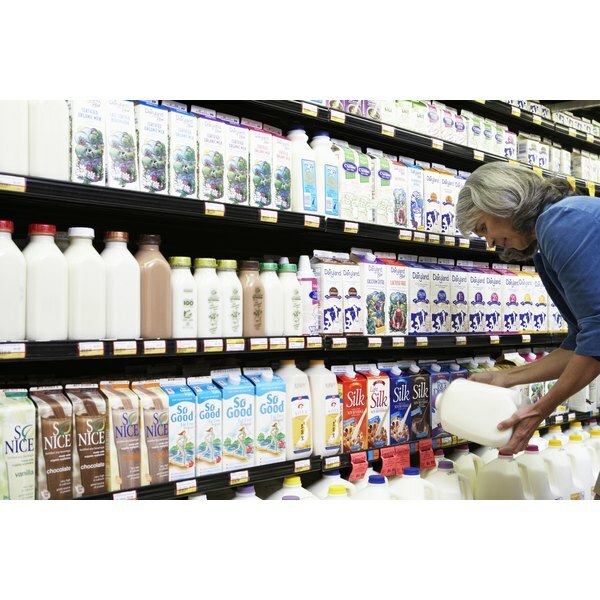 Can Soy Milk Cause Lactose Intolerance Symptoms? People who are lactose-intolerant often switch to lactose-free milk. Although lactose-free milk and regular milk have the same nutritional values, choosing to go without lactose can have consequences, particularly for children. Lactose is a sugar present in milk. People who are lactose-intolerant cannot manufacture their own lactase, the enzyme that digests lactose. They suffer from gas, bloating, abdominal pain and diarrhea when they consume dairy products. Makers of lactose-free milk add lactase to milk, which converts 70 to 100 percent of the lactose to glucose and galactose, two sugars that are easier to digest. Giving lactose-free milk to children means that they will not have lactose present in their stomachs. Lactose stimulates the body to make lactase, and without lactose in their diets, children could lose the ability to make lactase. There is an economic component to choosing lactose-free milk. It is usually more expensive than regular milk because it is a specialty product. Some consumers say lactose-free milk tastes sweeter than regular milk, although no sugar is added in processing. Others say the milk tastes more buttery. People who are allergic to milk, rather than lactose-intolerant, should not drink lactose-free milk as it still contains contain casein or whey, the proteins in milk that cause allergies. Is Rice Milk a Healthy Alternative?